My recent trip to one of my favorite places in the world, Mendocino, resulted in two amazing finds. Perfect for someone like me who loves to take beautiful things and repurpose them! It was way before sunrise when my husband went out to hit the beach in the headlands to see what had washed in overnight. A trip down the driftwood stairs to the beach and you are really in another world. This beach is one of our favorites. It is filled with beautiful driftwood that we use for his artwork. And today was a really lucky day. He found this beautiful abalone shell just waiting for me to take it home. It now holds the jewelry on my dressing table and is a real (and beautiful) treasure. 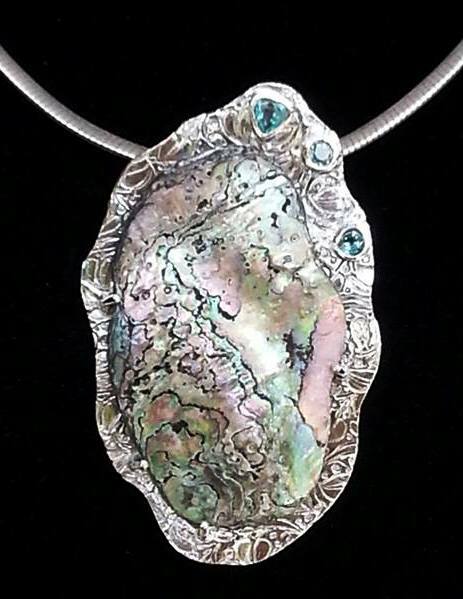 But that wasn’t all...he found a piece of abalone on the beach that is just perfect for a necklace. So with the help of a Southwest Florida jewelry designer, I was able to turn it into a beautiful one-of-a-kind necklace. Something that I will always treasure as much as my memories of Mendocino. It came at the perfect time for a fall fix: a trip to the northeast for the Interior Redecorators conference. I stayed at a lovely inn in Morristown, N.J., conveniently located next to the train station for easy access to NYC. The weather was beautiful and the trees made me think of fall in Virginia where I am from and North Carolina where I went to college. Our group toured Craftsman Farms, the former country estate of noted turn-of-the-century designer Gustav Stickley, a major proponent of the Arts and Crafts movement in decorative arts, home building and furnishing styles. Stickley combined the roles of designer and manufacturer, architect, publisher, philosopher, and social critic. He is best known today for his straightforward furniture, sometimes called “mission” or “Craftsman” furniture. This was of interest to me because I recently wrote an article on Stickley for the Fort Myers News-Press. We enjoyed an afternoon walking through beautiful and quaint Chester which was painted in fall colors, learned how to make ready made drapes look like a designer did them and spent time with designers from all over the country...including my friend and interior decorina, Pamela O’Brien of Pamela Hope Designs and had a wonderful dinner at the incredibly beautiful home of fellow designer Susan Hayes of Refeather Your Nest Decorating. Then it was off to NYC for a day at the New York Design Center where Lauri Ward of Use What You Have gave us an invaluable refresher course on how to best serve our clients. Having been to the NYDC many times, Pamela and I headed up to the newly opened 1stDibs on the 10th floor...fantastic for that unique accept piece or antique (take your checkbook with lots of $$$)!!! And then we hit the streets for a short walk and a timeout in Bryant Park on this gorgeous day. Now it’s back to work with lots of projects waiting! Need some help making a few fall changes in your home? I'm inspired! It‘s a steamy, hot day in southwest Florida and my thoughts have turned to my recent adventure to cool and blissful Mendocino. The haunting beauty of that area of the California coast is breathtaking and stays with you long after you leave. The most amazing quality of Mendocino is the peaceful and stunning quiet of the area. The first few times I was here, I thought that time had forgotten about Mendocino. But during this stay, I realized that the magic of the place is that it has forgotten time. And therein lies its rare, uncomplicated beauty. You can walk the blustery Headlands State Park (always reminds me of the Cliffs of Dover in England). Pick up colorful bits of this and that in nearby Glass Beach. Find some courage and go cave kayaking in the Pacific. Have a drink in front of the fireplace at the old Mendocino Hotel, a historic landmark, and let time transport you back to the 1850’s when the town was a booming port for logging trade. You can pick up beautiful pieces of driftwood on the beach or as I like to do, sit on a bench and take it all in. That is the pure joy of Mendocino, taking it all in. Since for me, it is always about the houses, I love to walk the streets and explore the Victorian and saltbox homes. Some have been forgotten and are overgrown with beautiful flowers. The rolling meadows and redwood trees and just the quiet of the village of Mendocino, make me think of the movies shot there, East of Eden with James Dean and Summer of 42. But mostly I love the fact that what happens in the rest of the world really doesn’t matter here. You can leave some cash in a jar after hours for the artist who leaves a few of her pieces for those who might visit after her studio closes. Or take a break and sit for a while on a mosaic sofa that nature has taken over. And one night I was taking a walk on the Headlands and stumbled into the playhouse where the Mendocino Theatre Company was presenting Master Class. I asked at the box office and they told me the show started in 10 minutes and since I did not have my purse with me, I could come back and leave my money in the mail box the next day. I did. I think life should always be this way but it only seems to happen in the quaint town that forgot about time. And there is my favorite bookstore, Gallery Bookshop, where you have a view of the Pacific and peruse all kinds of great books. And it is fun to stop in The Birdhouse(a studio that was converted from a water tower) where artist Monika Maluche makes her beautiful little ceramic birds. You can pick one up for $20. But my best find in Mendocino this visit was free. My husband, in the early morning hours, found a gorgeous intact, abalone shell that washed on the beach. Perfect to hold jewelry on my dressing table, it brings back all the perfect memories every day. I'll be back soon. It would be impossible for me to stay away. It doesn't matter where I am, I always look for decorating ideas! It’s a beautiful day in Seattle at Pike Place Market and I am taking a quick walkthrough. I am drawn to this place because where else can you have your picture taken with a 550 pound bronze pig named Rachel; dodge flying fish; sample fruits and vegetables, buy some really cool crafts and listen to entertainment? But really, for me it is the flowers and the colors. All fresh and locally grown. Wish I could take them all home with me. With Dale Chihuly at Chihuly Garden and Glass in Seattle.This was a day that I had looked forward to since the exhibition opened a year ago. Stained glass has always been one of my passions and I have dabbled in it for years. Dale Chihuly pushes the envelope with his dreamlike pieces. You want to stare at them for hours and that’s what I did.